At excellent value in today’s commercial property market, is the above four bedroom three storey end terraced property. Ideally situated along Main St, Stranorlar within walking distance to all local amenities both Stranorlar & Ballybofey. Offering three floors of spacious accommodation & large yard to rear, ideal Investment opportunity for many Investors. Accommodation comprises of entrance porch, hallway, sitting room, living room, kitchen whilst on the first floor three bedrooms (en-suite) and main bathroom. Second floor is attic space which can be easily divided to make two large double bedrooms. To rear of building is the yard that has a roller shutter for privacy, beyond that is additional parking. Contact this office for brochure or to arrange viewing. 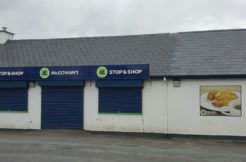 Situated along the main Ballybofey/Stranorlar route (N15) on Main Street. Located opposite Drumboe Avenue & Drumboe Lodge.